You'll be £14.99 closer to your next £10.00 credit when you purchase The Battle of Borodino. What's this? Order within the next 6 hours, 16 minutes to get your order processed the next working day! On 7 September 1812 at Borodino, 75 miles west of Moscow, the armies of the Russian and French empires clashed in one of the climactic battles of the Napoleonic Wars. This horrific - and controversial - contest has fascinated historians ever since. 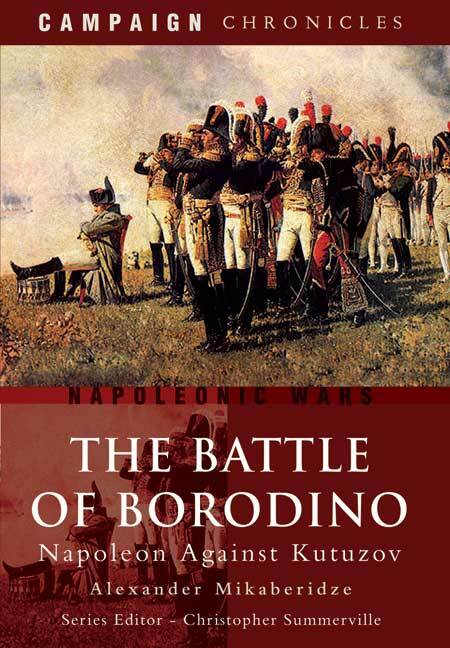 The survival of the Russian army after Borodino was a key factor in Napoleon's eventual defeat and the utter destruction of the French army of 1812. In this thought-provoking new study, Napoleonic historian Alexander Mikaberidze reconsiders the 1812 campaign and retells the terrible story of the Borodino battle as it was seen from the Russian point of view. His original and painstakingly researched investigation of this critical episode in Napoleon's invasion of Russia provides the reader with a fresh perspective on the battle and a broader understanding of the underlying reasons for the eventual Russian triumph. This book as just receive second prize by the Literary Committee of the International Napoleonic Society. A total of twelve distinguished works were carefully evaluated and Dr. Mikaberidze’s volume has met the rigorous criteria established by the Committee. The quality of the publication, especially in the area of research, originality, style and analysis, represents a significant contribution to Napoleonic Studies. Alexander Mikaberidze is one of the most important young Napoleonic scholars in the US, and this book is just another reason why that is the case. There have been a number of studies in English of the Battle of Borodino, fought between Napoleon's Grande Armèe and a Russian army led by General Kutuzov. That battle, fought on 7 September 1812 about 75 miles west of Moscow, captures the imagination regardless of which side you would have been on. Both the French and the Russians consider it a victory, and each side can make a decent argument (though to be technical, it was a French victory). What makes this book especially important, however, is the incredible breadth of sources used to produce it. Whether you are a scholar wanting verification of any new information or idea, or a general reader who rarely checks the references, you want a book to be based on outstanding research. Well, as my Australian friends would say, 'no worries here, mate.' Mikaberidze's list of sources is amazing. I counted 71 primary Russian sources and probably twice that many Russian secondary sources. These are not English translations, but rather the originals, often from Russian archival sources, and in many cases never used by western scholars until now. Mikaberidze uses an equally impressive set of English, French, German and Polish sources. Again, the reader of this review should not be put off by my discussion of the sources. One can read this book without looking at a single footnote and still learn a great deal about this battle, including the leadup and aftermath. This book gives readers at any level everything they could possibly want--and more. It belongs in anyone's Napoleonic library. The author had access to many Russian primary sources. This allows him to paint a detailed and balanced picture of the events. On 7th September 1812 in what was to be one of the largest battles of the Napoleonic War, the French and Russian armies met at Borodino, some 75 miles west of Moscow. The action was a key factor in Napoleon’s eventual defeat in Russia and the ultimate destruction of his army. Here the author reconsiders the 1812 campaign and relates the story of the battle from a Russian point of view. His research provides a fresh perspective on Borodino and offers a broader understanding of the underlying reasons for the eventual Russian triumph. First published in 2007, this paperback edition now offers another opportunity to purchase this interesting account. There are 10 maps, eight diagrams and numerous monochrome illustrations included in the book, along with orders of battle, a glossary, notes and sources, select bibliography and an index. This book has everythink you'd expect from the best of the 'Campaign Chronicle' series and one written by a man who is one of the leading 'young bloods' of Napoleonic history, Alex Mikaberidze. This is an invaluable source and a good read. This is a superb examination of a crucial battle, clearly written, readable but detailed and backed by very high quality research. ALEXANDER MIKABERIDZE is Hubert D. Humphreys Professor of History at Louisiana State University-Shreveport. He has written and edited over a dozen books, including Russian Eyewitness Accounts of the Campaign of 1812 and Russian Eyewitness Accounts of the Campaign of 1814. Alexander has also received the John Elting Award from the Napoleonic Historical Society for contributing to the study of Napoleonic history which was awarded to him for being a ‘fine historian’ and ‘great writer’.